This Ikea milk frother is a tiny little number that looks quite a bit like a champagne glass, and is priced so low that some think it won’t do the job correctly. It does, however, and especially if you are just a one-cup at a time household, could be the perfect additive to your morning. It’s great in that it doesn’t have the same features of a steam wand, which are connected to a big espresso machine, and so you have quite a bit more freedom when you are moving it around hand-held style. Some java and espresso bean fanatics think that they wouldn’t want a small unit that was battery-powered, but think again: you don’t have to be near a wall socket, and it can quickly do exactly what you need it to. Here are some of the features of this handy and strangely classy-for-the-price milk frother. Users are also appreciative of the speed for this gadget: it can produce the kind of foam you dream about to accompany your bagels or chessmen cookies in a refreshing drink fairly quickly. You don’t have to succumb to the beeping of your kitchen microwave early in the morning to have something killer like a cappuccino, and it’s just right there for you to fire up and prepare with. This is not the purchase that you will add to your kitchen that will necessarily last a very long time, and be around forever, but there are also three-packs of them sold in black if you want more to have on hand. It is one of the top-sellers on Amazon, and over 50% of users rated it with 5 stars. We suppose what’s really amazing about this is that users have claimed it even worked well with almond milk and vegan alternatives, albeit the foam can be a bit thicker. Just some of the great variations you can come up with flavor are adding vanilla, cocoa powder, and shaking cinnamon on Top. 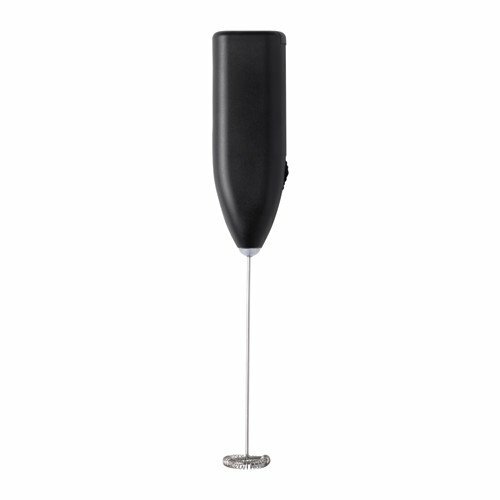 Some of the low reviews this Ikea milk frother has received are also from users who attempted to do things such as beat eggs with it; this is just simply not a good idea! Syrup is actually alright to use in it, and this is one way you can come up with some definitive and very awesome drinks. Just like any device used for the same purpose, you don’t want to over froth while using the Ikea milk frother, and you CAN do it if you really go to town after you notice that the milk has your desired texture. It’s really a device that should be used for just one cup’s additive, not to try and caffeinate an entire army. One very delighted user mixes coconut oil into the milk frother in the morning for an extra-delicious round of her favorite coffee, and also uses it later in the day to mix a powerful pre-workout powder with water before a very rigorous and cleansing exercise session. 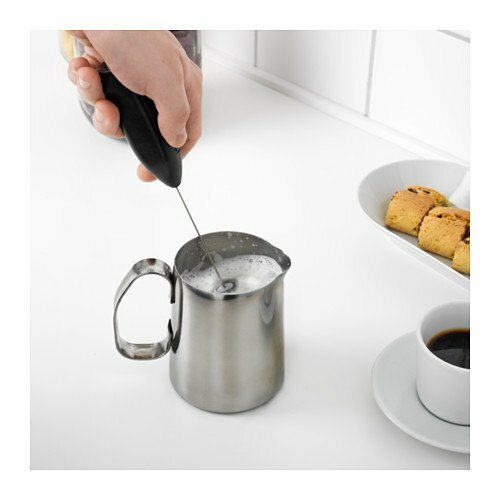 Some also think that this Ikea milk frother does not really have enough power to get the job done, but we think it’s once again great for the price, the batteries will last for quite some time, and you’ll have a small frother for your milk to prepare your drink specific to your tastes. Check this article about the Breville Milk Frother. Do you want to know more about other milk frothers? Check this Review.